Now this is what it is all about! 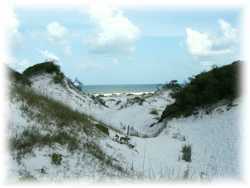 There is so much to discover on Florida's Nature Coast! Swimming, tubing, picnicking, fresh and salt water fishing, hunting, camping, canoeing, kayaking, scuba diving, golf, biking, bird and nature watching all await you. Have you heard about the springs? Most visitors to Florida never even know they are here, but they are, dozens and dozens of them, especially along the Nature Coast. And you're not going to believe how beautiful they are and the wealth of recreational opportunities they provide. Did I mention scuba diving? Certainly not for the inexperienced, Florida's springs draw expert cave divers from all over the world to discover the challenging warren of largely uncharted caves and underground rivers. Even if you are not an expert diver, in many of these springs, strong swimmers may don mask and fins to fight their way through a "boil" to view the chambers below. And best of all, the waters of Florida's springs remain a refreshing 72 degrees year round. Below is just a sampling. There are many more! A real treasure, Itchetucknee Springs is a crystal clear, spring fed river, running six miles through unspoiled hardwood hammocks and a world class destination for tube floating! 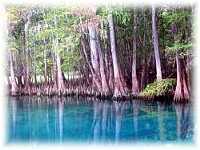 The river is fed by seven named springs, and countless unnamed ones. Visitors can swim in one or more of the named springs, and marvel at the 233 million gallons of clear water which daily bubble up from chambers in the earth. Then they can cast their tubes on the river waters and leisurely float through all the wonders nature has to offer. At 45 minutes, this spring is within easy reach of Hickory Haven. You don't want to miss it, and once you have experienced it, you will want to come back again and again. Here are some nice photos. Here is a personal account of the park. It's the ol' swimming hole, only you've never seen it like this! As one of Florida's 27 first magnitude springs, approximately 50 million gallons a day flow from Fanning Springs! You will marvel at the many "boils," and then you'll enjoy a day of refreshing swimming, exploring the springs, hiking, picnicking and relaxing! At only twenty minutes away from Hickory Haven, Fanning Springs is close enough for you to enjoy on the spur of the moment on a hot afternoon. Check out the photos on these links! As another of Florida's first magnitude springs, an astonishing 117 million gallons issue from Manatee Springs every day. A resource such as this, with it's ample fishing, hunting and recreation has supported human habitation for thousands of years, with a major Timucuan indian village known to have been on its banks. In addition to the usual activities, this spring is one of three in the state where visitors can easily and regularly observe manatee in the wild from winter through spring. And it's only 40 minutes from Hickory haven! This is a scuba diver's personal account of the springs. Here are some nice photos and one family's description of the park. Need we say more? Can you imagine all the recreational possibilities, the history, nature, and sport, that a fabled river like the Suwanee has to offer? And just a short fifteen minute drive from Hickory Haven and you will be on her banks! Here's a Suwanee River Tours site. Beaches? Did you say beaches? Sure, you've heard of Miami Beach, Daytona and Ft. Lauderdale, and they are great destinations, but have you ever wondered what a world-class Florida beach was like before all the hotels, restaurants and clubs? And how about the sunsets on the west coast beaches? With Hickory Haven as your base, you are closer to some of Florida's best kept secrets than the majority of the state. The beaches of the panhandle remain largely undiscovered, despite the fact that year after year they make it on the list of the top ten beaches of the world, right along side beaches in exotic Hawaii! Destin, St. Joseph's Peninsula State Park, Mexico Beach, St. George Island, once you have discovered the powdery, white sand dunes capped with sea oats, the turquoise waters, the unspoiled views, sport fishing known the world over, the laid back lifestyle, and the friendly folks, you'll know you have finally found The Real Florida, and you'll never want to leave! Florida, with all its natural resources, has made a real effort to ensure that everyone has access through their extensive trails development programs and the "Rails to Trails" project. This is especially true in the northern part of the state, where awareness of preserving our natural beauty came faster than development. Within an hours radius of Hickory Haven, you will find many opportunities to enjoy the best that trails have to offer, including inline skating, mountain biking, biking, hiking, walking, horse back riding, canoeing and kayaking, and all terrain vehicles. Here are just a few. Here in Florida, we love our festivals! It's the weather. What better way to get out and enjoy this glorious weather than to have a festival? And we've got festivals for everything: seafood, arts, food, country crafts, food, motorcycles, food, music, corn, nature, did I mention food? Festival season starts in the Spring and runs strong until it slows down a little in the dog days, only to pick up again in the fall. And let me tell you about spring and fall, from a native, people who say there isn't any change of seasons in Florida just haven't been paying attention. So get outside and see what I mean by attending one of the many festivals. Is chasing a little white ball over manicured lawns under a perfect sky your idea of getting out in nature? Well, if that's what it takes, here's are lists of area public and private courses. The area around Hickory Haven is steeped in history as old as the ancient moss-hung oaks. The bounty of the many springs, rivers and forests has drawn mankind to this place for ten thousand years. Mastodons once roamed this area, and their massive bones have been found in many of the springs. General Lafayette was awarded a land grant in the area in appreciation for his substantial contribution to the War of Independence. Neighboring Lafayette County is named in his honor. During the Seminole Indian Wars, General Andrew Jackson and his men roamed this area rousting out native Americans disenfranchised from their more northern homes. While here, he presided over an incident so controversial on a global scale that it nearly ended his career in ignominy. Instead, the United States stood by him, and the subsequent international wranglings with Spain led to the acquisition of the Florida peninsula and General Jackson became its first governor. There are several area Civil War reenactments annually. You could even find a buried treasure, for their are such tales of a treasure buried in Cross City, and other similar tales of secreted pirate treasures, or lost Civil War payrolls in the area. If history is your interest, you will never tire of learning all the area has to offer. And if you really must, all the razzle dazzle of Orlando and the theme parks is still only a day trip away. So what are you waiting for? You've got so much to do! Follow this link to the contact information so you can Make An Inquiry.